READY TO BOOK? CLICK HERE. WANT THE PRICE SHEET RIGHT AWAY? CLICK HERE. 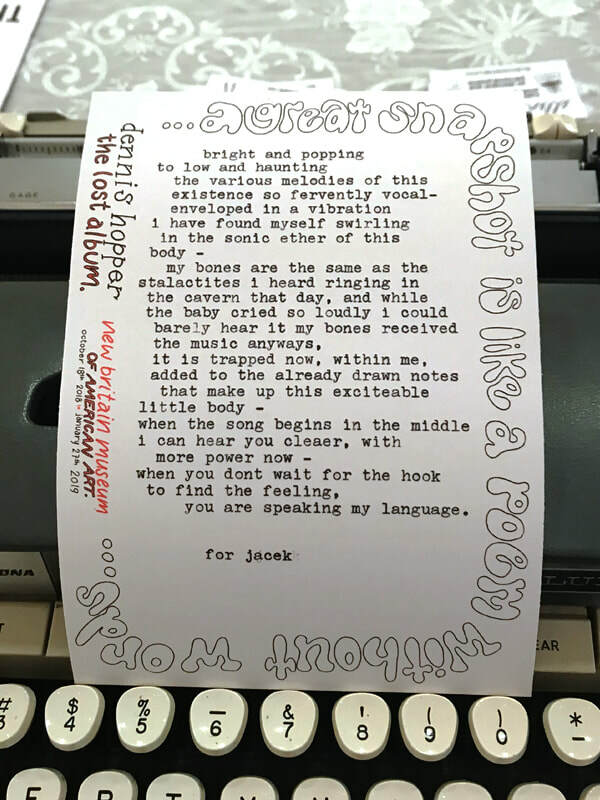 A COSMICALLY ALIGNED TYPEWRITER POET FOR HIRE. 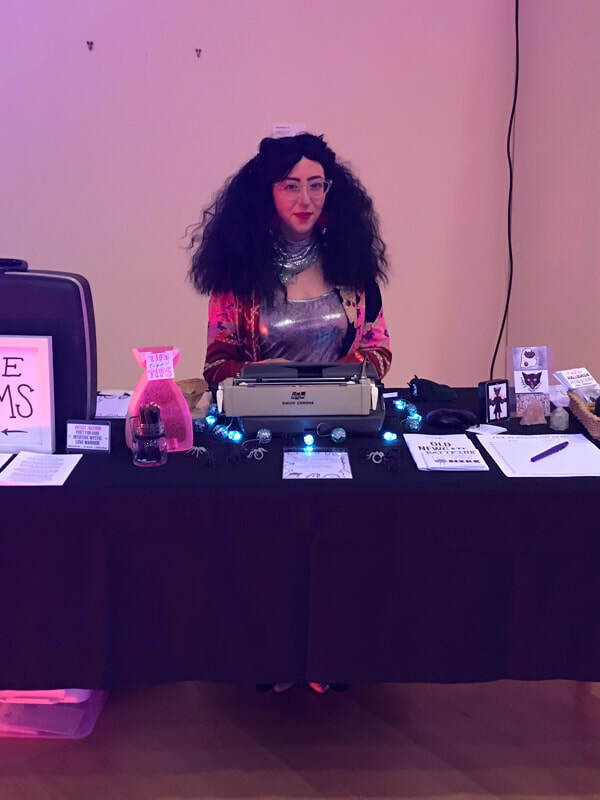 It is my joy and honor to bring my Typewriter Poetry entertainment and event specific custom illustrated/lettered Poetry Cards to events big and small, private and public, personal and corporate. Any event or moment is the perfect opportunity to provide guests and visitors with this keepsake, memorable, and meaningful experience. As an intuitive mystic, I am able to tap into my awareness of and connection to the Universal energies that bind us all. I work every day to foster this connection to the Universe, to the Akash, to all the Spirits and Souls that love and guide me. As a love warrior, I work purely in the service of love, bringing this devotion and true calling to everything that I create and do. 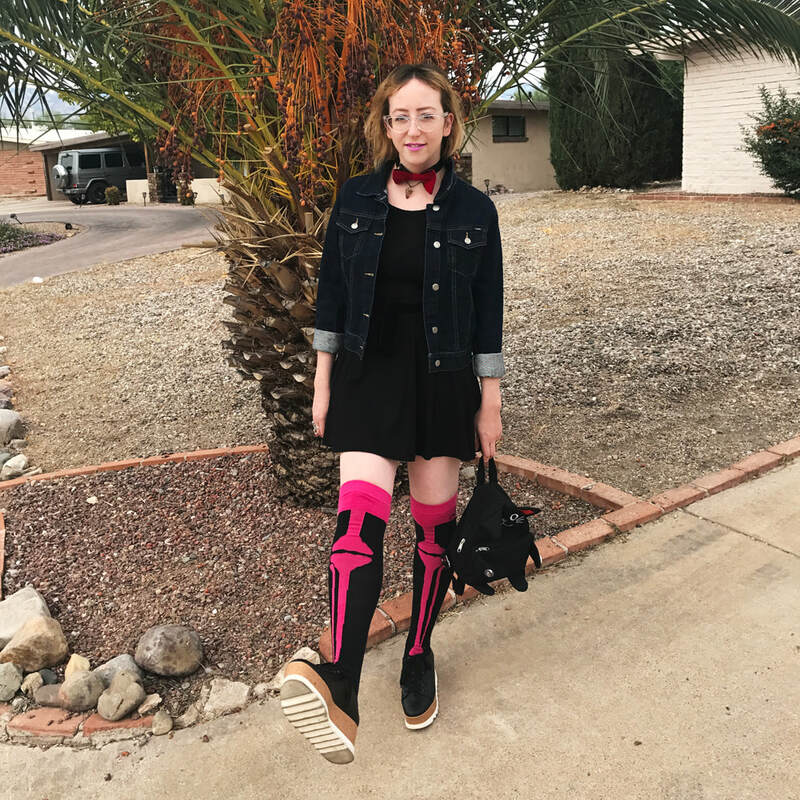 Through this deep connection, I am able to create an experience that is something like a mini therapy session, a gentle psychic reading, and a personal performance art piece -- a moment that is immersive, memorable, and sometimes even transformational. 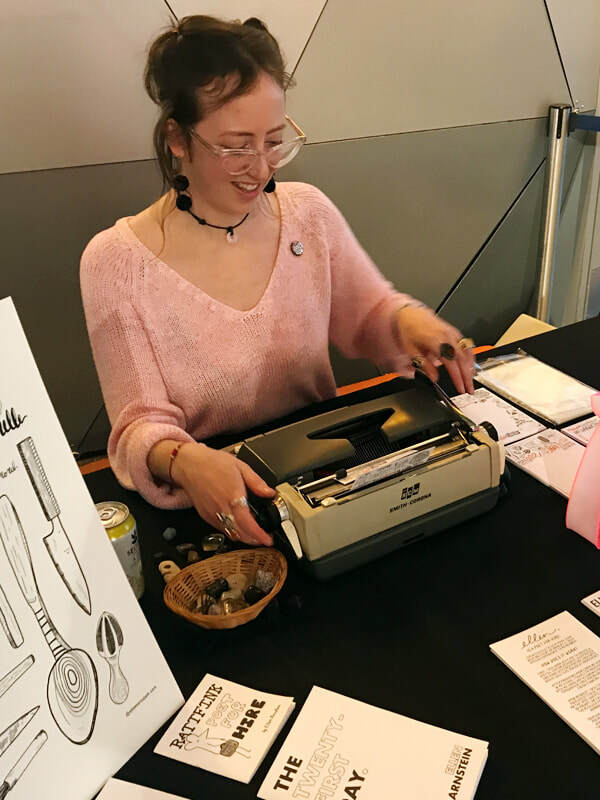 The Typewriter Poetry by Ellen experience is one that is sure to leave your guests connected, excited, and eager to share. 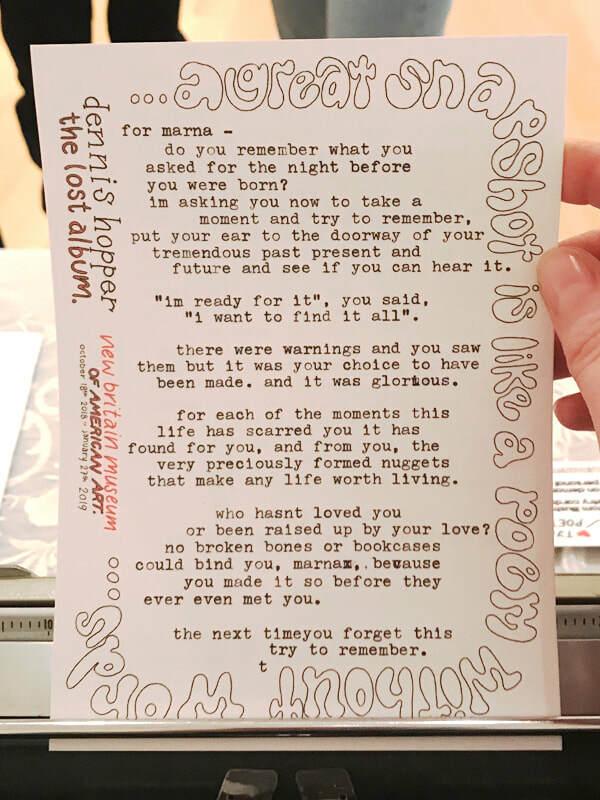 Each guest who participates leaves with their very own Personal Poetry Art Print, ready to frame, share, and cherish, and is the exact sort of keepsake takeaway that you have been desperate but unable to find for your next exciting event. The entire experience, from start to finish, also lends itself beautifully to the content-rich style of sharing we strive for both personally and professionally, as well. I look forward to working with you soon! Please don't hesitate to email me at ellen@ellenarnstein.com to find out more or to book me for your next happening! Keep reading for more detailed information about how the whole experience works. When a guest sits down across from me to request their poem, they are welcomed to prompt me in any way. Invariably, most times this prompt comes through as a sort of mini-bio, focused on whatever is deeply and emotionally prevalent for the guest at that time. When this doesn't happen, something more playful does, and instead of a deep emotional prompt I receive a directive that stems from curiosity, incredulity, or just pure joy. 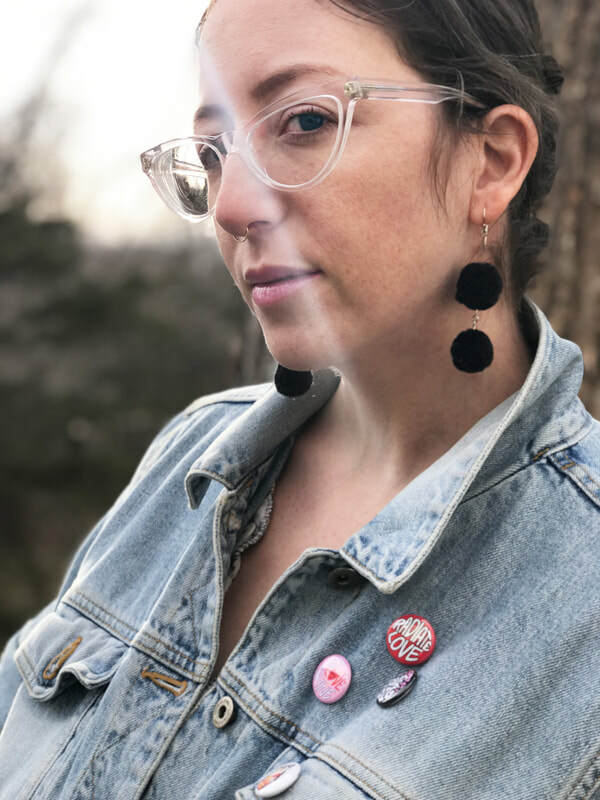 I have written poems prompted by a wide variety of directives, from "the color green" to "my mother visits me as a cardinal" to "a cheetah, a crystal, and a rainbow" to "a poem that favors form over function" and everything in between. I have also written many poems unprompted, which is always a joy as it gives the muses at play in that moment a chance to truly show up and express themselves. As an intuitive mystic, I am able to utilize my connection to the Universe, to the Akash, and t use these prompts as a starting point for an often heart opening journey that takes just 5-7 minutes, and ends with a delightfully meaningful and often surprisingly personal poem. By being able to tap into the etheric energies that connect us all, I am able to use these bits of personal expression given to me as entre into a deeper, more cosmic connection. 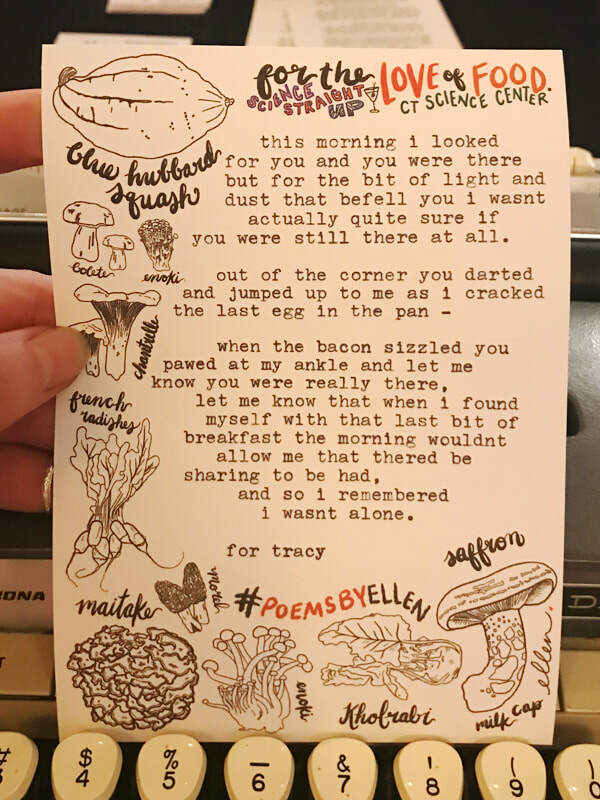 Even just sitting across from someone completely unprompted often leads to a poem that connects more than expected. When I typewrite poems for people, I feel as though I am a cypher, or vessel. I often hear the first line, as if spoken from a moment in time where I have always existed, and it is then that I know that my fingers will take care of the rest. Once I connect, the poem writes itself quite quickly, even with distractions at hand. I work are celebrations attended by many people, loud noises, music, and even other entertainers are often part of the sound/energy-scape that surrounds me. I really enjoy the way that each event provides a different set of challenges and inspirations in this way, and I find that my poetry practice only benefits from having to work with these other bits of experience happening around me. Almost always, after being handed their poem the recipient will stop and read what has been written for them, right there on the spot. Often times they read it out loud, contributing to the performance and spectacle for all. Other times, they read it in silence, inevitably handing it over to their friend or lover in amazement, so that they can see the magic, too. Once the poem has been read, the recipient always looks at me in wonder, often asking aloud, "How did you know that? ", or stating something like, "This is so me." All I can do is smile and say, "It's just what I do!". 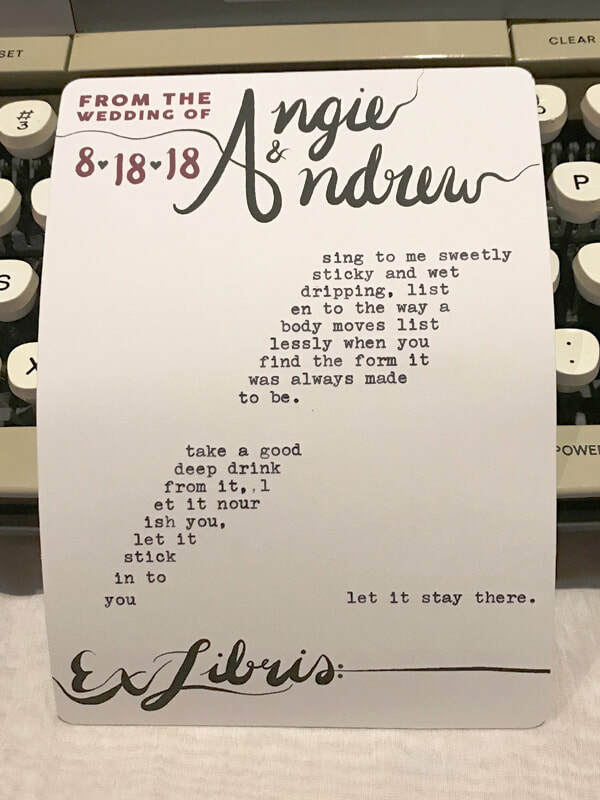 Each finished typewriter poem is actually a personal Poetry Art Print -- a one-of-a-kind keepsake -- ready to frame, share, and treasure for years to come. 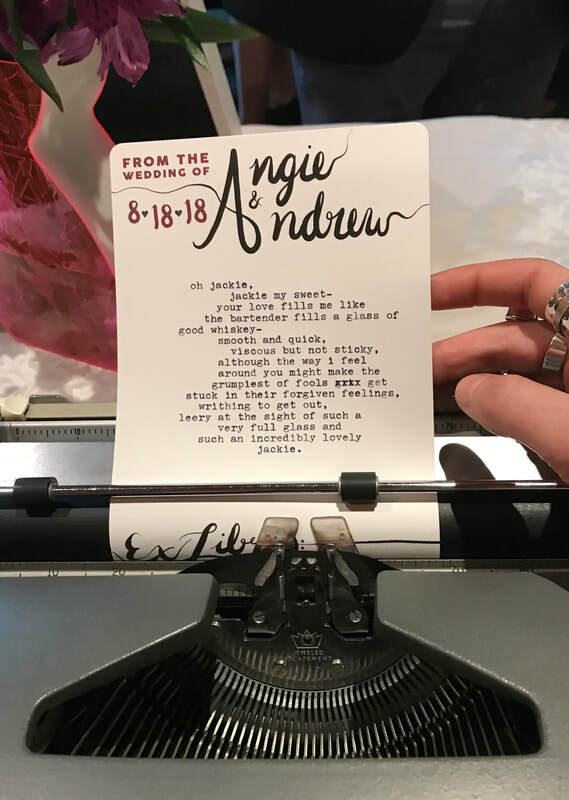 Guests who leave with a personal poem are sure to share their newfound Text and Image Art Piece with friends and family, in person and on social media. The entire experience lends itself beautifully to the type of content rich type of sharing we are so used to today, and that so many of us are looking to encourage at our events. INTERESTED IN HIRING ME FOR YOUR NEXT INSTITUTIONAL / CORPORATE EVENT? I LOVE WORKING WITH LOCAL SHOPS & BUSINESSES, MUSEUMS, HISTORIC SITES, LIBRARIES, CORPORATE FIRMS AND MORE! I OFFER SPECIAL DISCOUNTED PRICING FOR NON-PROFITS AND OTHER SMALLER ORGANIZATIONS LOOKING TO BRING MY POETRY & ENRICHMENT SERVICES TO THEIR INSPIRING AND CULTURALLY SIGNIFICANT VENUES. I HAVE RECENTLY WORKED WITH THE NEW BRITAIN MUSEUM OF AMERICAN ART, OLD NEW-GATE PRISON, AND THE CT SCIENCE CENTER. PLEASE INQUIRE FOR MORE DETAILED PRICING AND BOOKING INFORMATION! all requests will be responded to within one (1) business day, and i am always happy to consider last minute date requests - it is most certainly worth asking!